Hi loves! Today I have 2 more Femme Fatale Cosmetics shades for you. I am a bit ashamed how long it took me to edit these pictures, I already took the pictures the 3rd of June! Well better late than never (hangs head in shame), lets take a look at the pretties :-). First up is Femme Fatale Cosmetics A Tisket, A Tasket. 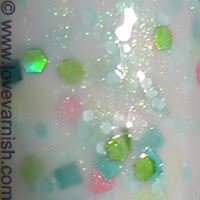 This is described as: a semi-opaque white polish with green shimmers and various glitter in pink, teal and green. We have kept the base sheer to let the glitter show through. I used 3 coats of this one and it isn't supereasy to work with, but worth it in my opinion! The sheer white base combined with the glitter and green shimmer is unique and very magical to look at. It's very important to let the coats dry in between! Otherwise you'll drag everything around. Next up is Femme Fatale Cosmetics Miasma. This is described as: a deep grey toned purple creme based polish with various glitters in lavender, purple red and black. Patience may be required with location of the black dot glitter during application :). That huge black dot you see in the second picture? Couldn't get it out :-(. But I blame that one the mini bottle, though large glitters like these almost always require some fishing. Rest of the application was just fine, the jelly base is very flowy so it spreads nicely. 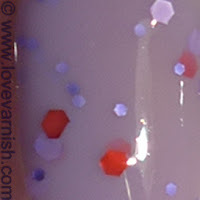 I like the contrast of the red glitter in the purple base! Both shades are now discontinued, so grab yours while they are still available! A Tisket, A Tasket is so pretty! Shame its being discontinued. noooooooooooooooooooooo why did you have to show me these! It is! I quite like it :). Haha, ik las tot het woordje haat, ik dacht neeeeee! Maar gelukkig, er zit ook nog wat liefde bij :-). Thanks voor de lieve woorden, vind ik echt heel leuk!